In its most ambitious production to date, The Tavern stage becomes Egypt and Rome to tell this story of a passion so legendary that it ignites battles and jeopardizes kingdoms, ultimately consuming its lovers and the entire ancient world. 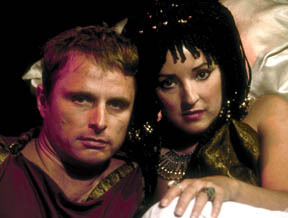 The heat of Antony & Cleopatra is certain to lessen the chill of fall. Curt liked this "stripped down" version of one of Shakespeare's most complicated plays. He says the Tavern's production offers a suprising amount of humor, although at times it leads to unintended laughter. He notes that fine performances are given by Agnes Harty, Jennifer Atkin, Maruice Ralston, Jen Apkar and Neil T. Necastro. Wendell sez "Antony and Cleopatra" is a saucy and lusty soap opera and that the Tavern gives it a solid and straightforward production. He praises Agnes Lucinda Hardy's Cleopatra as well as David Harrill, Jen Apgar and Neil T. Necastro Jr. Unfortunately, he says the weakest link is Dikran Tulain's Antony.